In their respective efforts to understand the universe and all it comprises, there is a telling gap between what cosmologists and astrophysicists study and how they study it: scale. Cosmologists typically focus on the large-scale properties of the universe as a whole, such as galaxies and intergalactic medium; while astrophysicists are more interested in testing physical theories of small- to medium-sized objects, such as stars, supernovae and interstellar medium. And yet the two fields are more closely aligned than it might seem at first glance, especially when looking at how the early universe was formed. "The first supernovae are especially interesting not only to people who study stars but also those doing cosmology," said Ken Chen, an astrophysicist at the East Asian Core Observatories Association (EACOA) and lead author on a paper in The Astrophysical Journal that examines how the first supernovae influenced star formation and, along with it, the evolution of the universe. "Those first stars were very massive, and the supernovae that came from these first stars were also the source of most of the heavy elements in the periodical table. For cosmologists, these metals are very important because they provided cooling and changed the mass scale of the star formation, which also determined the appearance of galaxies later." For this study, Chen and colleagues from Portsmouth University and Universität Heidelberg ran simulations on the Edison supercomputer at Lawrence Berkeley National Laboratory's National Energy Research Scientific Computing Center (NERSC) to illustrate how heavy metals expelled from exploding supernovae helped the first stars in the universe regulate subsequent star formation. The idea was to take Chen's previous supernovae research and extend it into cosmology. NERSC is a DOE Office of Science User Facility. "We wanted to understand the death of the massive stars in the early universe—the supernovae—and how their explosions later affected star formation in the universe," Chen said. "There are many scenarios in which heavy elements from the first supernovae were taken up into second-generation stars, but cosmological simulations model them on the largest scales. Cosmologists tend to want to see the formation of galaxies or cosmic structures. But in those kinds of simulations you aren't able to resolve the small details, the fine structures of how the supernovae actually affect the surrounding gas and change the star formation." 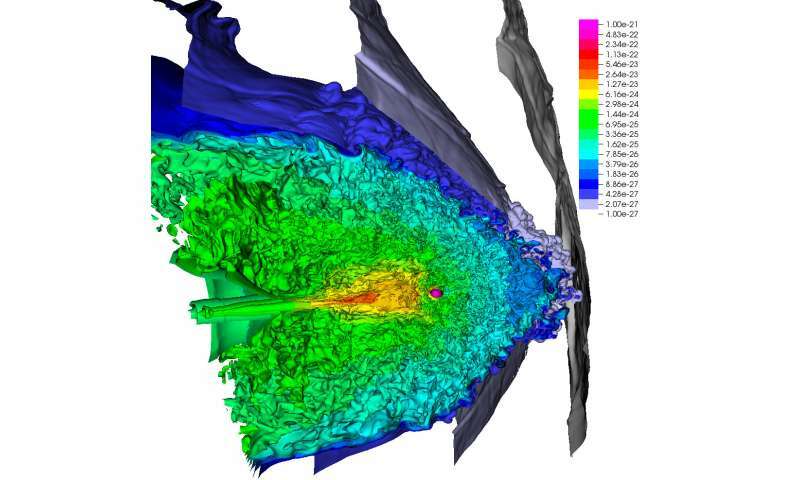 So he and his collaborators ran small-scale, high-resolution simulations of the chemical enrichment of a dark matter halo via metals from a nearby supernova explosion after partial evaporation by the progenitor star. The team used several hundred thousand compute hours at NERSC to produce a series of 2-D and 3-D simulations that helped them examine the role of dark matter halo photoevaporation—where energetic radiation ionizes gas and causes it to disperse away from the halo—played not just in the early formation of stars but also the assembly of later galaxies. "In the early universe, the stars were massive and the radiation they emitted was very strong," Chen explained. "So if you have this radiation before that star explodes and becomes a supernova, the radiation has already caused significant damage to the gas surrounding the star's halo." The partial evaporation of the halo prior to the explosion is crucial to its later enrichment by the supernova, he emphasized. In addition, how the metals ejected from the explosion mix with the halo is critical for predicting the amount of metals in a second-generation star, which influences the size and mass of these stars and, thus, the composition of the galaxy. But previous cosmology studies have not connected the dots between star formation and galaxy formation in this kind of detail, Chen noted. That's what prompted the researchers to use a multi-scale, multi-physics approach, employing two different codes: ZEUS-MP, which has the radiation transport required to evaporate the halo, and CASTRO, which was developed at Berkeley Lab and has the adaptive mesh refinement needed to resolve the collision of the ejected metal with the halo. "The technical details and different physics make these simulations much more complicated and difficult, but we are trying to fill the gap between small stellar-scale and large galactic-scale simulations," Chen said, adding that he believes this study is a first of its kind. "We are trying to push the boundaries and connect what appears to be two different things, but they are actually closely aligned." Chen—who has been computing at NERSC since 2009, starting when he was a graduate student at the University of Minnesota, Twin Cities—credits the center's staff as well as the supercomputers for making this work possible. "The critical factor for making the machine become the most productive is not only about the speed of that machine but how effectively you can run the job, and that requires significant effort of support from the scientific and technical staff. This makes it possible to work much faster, and that is very critical." The proof offered by the author is his word. We must believe - in the word of authority. The chemical composition of supernova residues is hydrogen, helium and all other trace atoms. (proof) but we must believe in the word authority, that it was once, as he says.